Although the Reverse Mortgage...aka HECM (Home Equity Conversion Mortgage) hasn’t always had the best reputation, it is now safer than ever. Much of its past notoriety stemmed from the mistaken belief that a reverse mortgage was best used as a “loan of last resort” to keep seniors in homes they could no longer afford to maintain or, worse, as a windfall to buy a yacht or dream vacation. Unfortunately, some borrowers got HECM loans they didn’t understand, didn’t need or couldn’t afford. It is true that HECMs are exempt from the TRID consumer-disclosure regulations and Qualified Mortgage (QM) rules, but they are subject to their own policies designed to verify the borrower’s financial capacity and willingness to comply with loan requirements. Moreover, three key regulatory changes over the past four years virtually eliminated past risks for HECM lenders and borrowers. First, the U.S. Department of Housing and Urban Development (HUD) set limits on how much borrowers can draw at closing or during the first 12 months following closing. Under the new limits, most HECM borrowers access no more than 60 percent of their principal limit during the first 12 months. Lump-sum draws in excess of 60 percent of the maximum loan amount are supported only in special circumstances, such as when a borrower needs to pay off an existing mortgage or federal debt. HUD also added protections that enable qualified non-borrowing spouses to continue occupying the home and defer loan repayment when the borrower has passed away. Perhaps the most significant change, however, was the addition of new Financial Assessment rules to ensure HECMs are offered only to financially qualified borrowers. HECM lenders now must review a borrower’s credit history, income, assets, debt and history of paying property taxes, insurance and homeowners association fees. If a lender determines the loan will not be sustainable, it can either deny the application or establish a life-expectancy set-aside (LESA). This is equivalent to an escrow account in traditional mortgage lending and is used to pay the borrower’s taxes and insurance. The Financial Assessment rules have cut tax and insurance defaults on HECMs by more than 70 percent and serious defaults by almost 65 percent, according to data compiled by New View Advisors. Nearly four in 10 single-family homes were sold to first-time home-buyers during the first quarter of 2017, an 11 percent year-over-year increase, according to Genworth’s First-Time Homebuyer Market Report. More than three-quarters of these borrowers made their purchases with a low-downpayment product, with close to half of those choosing a Federal Housing Administration (FHA) low-downpayment loan. In response to this trend, many of the national lenders I use, now offer zero-down loans for first-time buyers, who skew young and tend to have a lot of debt and not much in the way of assets. Originators can add the HECM as a way to extend this philosophy of “meeting borrowers where they are” within their borrowing lifecycle. Just as FHA first-time homebuyer programs are designed to serve the special needs of younger borrowers, the FHA-insured HECM is specifically designed to serve homeowners who are 62 years of age and older. Together, these products are the ideal bookends to a generational lending approach that creates repeat business by adapting to borrower needs as they change over time. 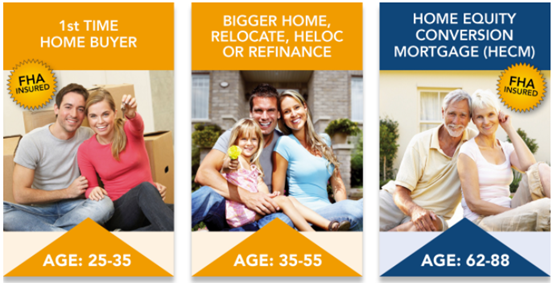 Much like first-time homebuyers, retirement-age borrowers have unique characteristics. Older borrowers are likely to have more assets than first-time borrowers, so up-front loan costs are not as big a hurdle. On the other hand, retirees are highly motivated to protect their accumulated assets to ensure they can pay for a long and comfortable retirement. In addition, many retirement-age homeowners are living on reduced or fixed incomes, so loans with low or flexible monthly payments are a plus. A HECM for purchase can be the ideal loan product for seniors seeking this sort of flexibility. It can enable borrowers to purchase a dream home without digging into their retirement savings or committing to a required monthly principal-plus-interest repayment obligation. Of course, not all retirees are looking to purchase another home. Today, many prefer to remain in their homes and age in place. A HECM can be the perfect product for an aging homeowner who’s accrued a lot of home equity but is worried about having enough income to live comfortably. With a HECM, homeowners can tap into a portion of their home’s equity to help pay for living and other retirement expenses, especially during months or years when stock markets are down and investment savings are best left untouched. Like a typical mortgage, the HUD-insured HECM can be structured with a fixed rate or an adjustable rate. Fixed-rate HECM loans are disbursed as a single lump-sum payment. For adjustable-rate HECMs, borrowers can choose to receive a monthly payment or a line of credit. Unlike a typical mortgage, however, a HECM requires no monthly mortgage payment. As long as borrowers maintain the home as their primary residence and remain current with their property taxes, homeowner’s insurance and any other required property charges (like homeowners association fees), the HECM does not have to be repaid until the borrowers die or move out of the home. Many federal- and state-sponsored first-time homebuyer assistance programs require potential borrowers to complete homebuyer education before purchasing their first home. Similarly, borrowers considering a HECM must obtain counseling from an independent, third-party counselor so they can make an informed decision. These counseling requirements help ensure that first-time buyers and HECM borrowers receive coaching on their obligations as borrowers, what is required to avoid defaulting on the loan and what happens if the required payments aren’t made. This education greatly reduces default risk for both borrowers and lenders. This required counseling can extend the origination timeline, but usually by no more than a few days or weeks. As long as lenders understand the origination timeline upfront and communicate the need for counseling to their HECM borrowers, they can manage their workload and their borrowers’ expectations accordingly. HECM loans are a specialized product, so it is important that originators receive specialized training on how they function and how to work with borrowers. Mortgage companies with dedicated reverse mortgage divisions may offer in-house HECM training programs, but training also is available from external providers or through the National Reverse Mortgage Lending Association (NRMLA).